Welcome to Rise of the Goblin Nation! In this RPG you will play as a goblin, weakest of all the monsters in the known world but also the one with the greatest potential. As a newborn goblin you will have to learn how to fight and survive in this harsh, new world. RGN (Rise of the Goblin Nation) combines the Rank-up System from Re:Monster, the Job System from Final Fantasy Tactics, and the Skill System from Skyrim to create something new and different -- a sandbox system where anything from what you eat and how you play, will help mold your character into a living legend. How the system works. Most actions you take in the story are represented by a skill: if you swing a weapon for example, you just used a skill; if you go swimming, you're using a skill. And the more often you use a skill, the better you become at performing the associated action. Items are also important, since they will improve the damage you deal (DMG) and increase your total health pool (HP). Finally, combat is a turn-based system where the fastest character always attacks first. At the start of the story that will be the players. If a monster survives the player's attack, I will then take control of the monster and attack for it. If a player's HP reaches 0, they'll die and will have to start all over again as a newborn goblin. The only exceptions to this rule are resurrection magics and revive potions. None of which will be available at the start of the game. Skills. As I said before, skills represent your actions in the story. And the more you use them, the better you become at performing those actions. There are 7 tiers for each skill, and pushing them to their limits will unlock some ridiculous abilities for your character to use, like being able to jump over a castle's walls. Items. Items come in various forms and have unique effects. Armor items will boost your health. Weapon items will boost your damage. Potions will restore your health instantly, while elixers will give you health over time. All of these can be crafted, bought, or traded for. Combat. When a fight begins, the fastest character will always move first. If players group up to take on a monster, then the monster will wait it's turn until all of the players attack. If the monster survives, I will take control of it and take an action. After that it will be the players turn again. If the monster dies, players can loot the body for useful items -- provided they have the necessary tools to do so. Every night while your goblin sleeps, they'll get relevant updates on their skills, items, health, ect. Goblins will also heal as they sleep. The more injured they are, the longer they'll need to rest to recover. Eating food will help with their recovery. - Skills and the Rank-up System. - Character Sheet, and Rank-up System explained further. - Hobgoblins, Hobbes, Sidhe, Fae, Álfar, and Dökkálfar explained. - Default Job Skills and Rank-Up changes. - Important NPCs and Locations. Edited by The Illuminati, 23 January 2017 - 03:27 PM. "Grabbing it. Keeping it. Using It." "We provide the blueprint. And we give the Instructions." Finally!!! thanks a lot man! LocationRiding the back of the Great A'tuin. Once more unto the break, dear friends, once more. While we fade away from the bustling market where our benevolent giant resides, we spend what seems to be endless hours winding through the unfamiliar cobblestone streets. Slithering through the labyrinth of darkened streets and narrow passages until in this expansive city, we reach a place where the light rarely touches. There, beneath a fickle and flickering lamp, sitting upon her throne that marks her the queen of the underworld with a cunning and seductive smile is none other than I-Am-X. Calmly observing us with a yellowed iris beset upon harrowing black, her fanged grin only grows wider as her fingertip guides the rod that stirs a tall, thin glass of suspicious looking Red Wine. Here in the Dark, we exist temporarily in her Kingdom. A place where the unsavory sorts can find sanctuary, a black market, and often the tools of death, subtlety, and subterfuge. Sliding her sultry fingertip upon the spine of a book, the tome seems almost alive as it shudders and props open to a blank, but weathered page. Dipping a sharpened fountain pen in ink, she takes her mark upon the leathery parchment after a sip of her Bloodied delicacy. Not a moment later for us, the innocent-minded folks living upon the streets above, she describes to us her next devilish machination. 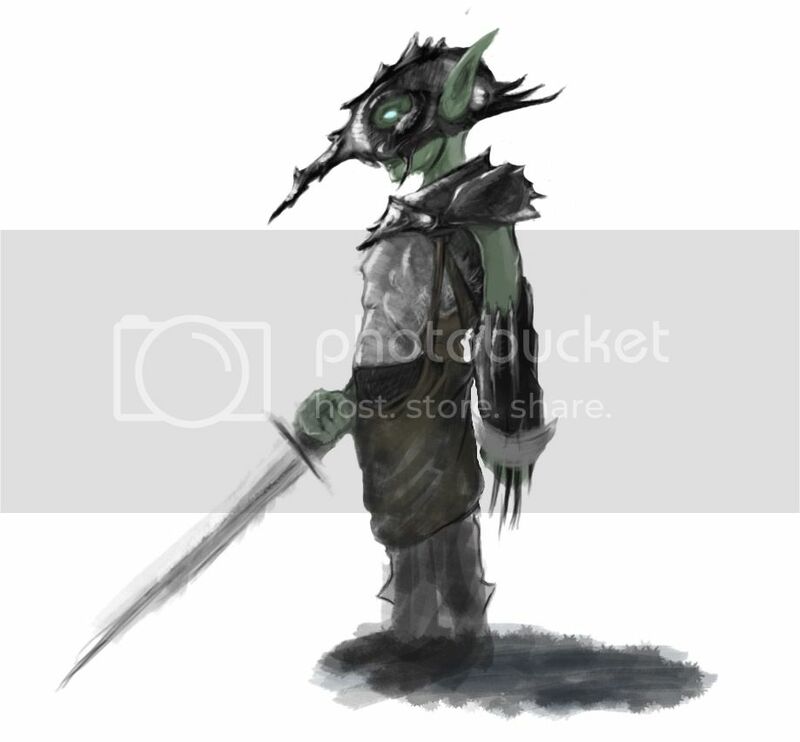 What does a goblin look like in this rp? Are they what you would normally think a goblin looks like? Do they have human appearances? Does their appearance change as they get stronger? I'm asking for the sake of images and coherency. - Goblins that favor heavy weapons (hammers, greatswords, greataxes, ect) have the option to become Orcs, Ogres, and Minotaurs. - Goblins that favor medium weapons (swords, shields, axes, ect.) have the option to become Hobgoblins, Hobbes, and Sidhe. - Goblins that favor light or ranged weapons (daggers, bows, crossbows, ect.) have the option to become Fae, Álfar, and Dökkálfar. - Goblins that drink enough fresh blood have the option to become Vampires, Dhampirs, and Alucards. - Goblins that eat enough rotten meat have the option to become Ghouls, Trolls, and Wendigoes. - Goblins that eat enough raw meat have the option to become Skinwalkers, Shapeshifters, and Werebeast. - Goblins that eat enough plants have the option to become Dryads, Nymphs, and Druids. * Ranged Spellcasters: Spell Knights/Dames, Mage Lords, and Magic Kings/Queens. * Close Quarter Spellcasters: Quarter Spell Blades, Half Spell Blades, and Spell Blades. * Holy Blessings: Nephalim, Aasimar, and Celestials. * Infernal Blessings: Tieflings, Fiends, and Teufel. - Goblins that unlock every rank-up will become: Super Goblins, Master Goblins, and Goblin Gods. @KDP: Goblins in this RP look like what you would normally think a goblin looks like. Short, mischievous, green, big ears, ect. Do they have human appearances? They're humanoid (2 legs, 2 arms, 1 head) but are the size of human toddlers. Does their appearance change as they get stronger? Yes. Heavies (heavy weapon users) are the biggest, and most mostrous. Mediums look the most human (in size and appearance). Lights, Ranged, and Spellcasters look the most elven. Edited by The Illuminati, 23 November 2016 - 03:09 PM. - Basic Jobs: Warriors (War), Archers (Arc), Chemists (Ch), Merchants (Merc), Brawlers (Br), and Rangers (Rng). - Advance Jobs: Barbarians and Fighters (War), Hunters and Snipers (Arc), Alchemists and Mages (Ch), Orators and Arithmaticians (Merc), Monks and Ninjas (Br), Beastmasters and Monster Tamers (Rng). * Second Advance Jobs: Duelists (War, Arc), Warmasters (War, Arc, Br), Battlemages and Guardians (War, Ch), Shadow Disciples and Spellcloaks (Arc, Ch), Rogues and Smugglers (any basic, combat job, Merc), and Jacks of Skills (master all of the basic jobs). - Expert Jobs: Gladiators (Barbarian), Knights (Fighter), Witchers (Hunter), Assassins (Sniper), Potions Masters (Alchemist), Priests and Wizards (Mage), Bards/Dancers (Orator), Prodigies (Arithmatician), Iron Fists (Monk), Kages (Ninja), Beastlords (Beastmaster), and Monster Ranchers (Monster Tamer). * Second Expert Jobs: Avengers and Slayers (Duelist), Warchiefs (Warmaster), Champions (Battlemage), Crusaders (Guardian), Shadow Masters (Shadow Disciple), Arcanists (Spellcloak), Anarchists (Rogue), Pirates (Smuggler), and Kings/Queens of Skills (master all of the advance jobs). - Master Jobs: Samurai (Gladiator, Sniper, Battlemage), Lancers (Knight, Beastmaster/Monster Tamer, Monk), Paladins (Witcher, Knight, Priest), Black Knights (Assassin, Knight, Wizard), Sorcerers (Priest, Wizard), Sages (Potions Master, Sorcerer), Mystics (Alchemist, Sorcerer), Illusionists (Bard/Dancer, Mage), Gokages (Kage, Mage), Apex Predators (Beastlord, Iron Fist), Terreres (Anarchist, Pirate), and Gadgeteers (Prodigy, Priest/Wizard, Alchemist). - Legendary Jobs: Time Mages (Sage, Mystic), Holy Knights (Paladin), Hell Knights (Black Knight), Machinists (Gadgeteer), Gunners (Gadgeteer, Sniper), Elementalists (Sorcerer, Arcanist), Archmages (Sage, Mystic, Shadow Master, Arcanist), Gods of War (Avenger, Slayer, Warchief, Champion, Crusader), and Ace of Skills (learn every expert and master job). Edited by The Illuminati, 17 October 2016 - 03:28 PM. So I guess the skills are pre made? Do you guys have any questions so far? A quick note about the rank-up and job systems: you rank-up/unlock a job once you clear the objectives for that specific rank-up or job. So for a warrior, you just have to use a weapon until the weapon skill hits 100 points. Then, once you go to sleep, I'll give you your stats and you can choose to rank-up or not/choose a job. Rank-ups are irreversable. So if you become an orc, then switch to magic, you'll stay an orc until you switch back to using heavy weapons. You'll also only do half of the expected damage and take twice as long to become a mage. This applies to every instance of playing against type. So we can learn every skill under every job? So I guess the skills are pre made? No. You get to create your own skills and abilities. I'll just say what each job is basically supposed to do. If someone needs help with skills/abilities, then I'll suggest something. For the items, minerals, and such I do have a list. Edited by The Illuminati, 14 October 2016 - 03:14 AM. Are he classes just classes and we can go based off of obviousness? I'm not sure I understand the question. The classes/jobs are there to help shape the fantasy that you want to create. That said, they do come with real restrictions. For example, a barbarian would never use a shield. And if they tried to, they would only get half the benefits from using one. On the other hand, you can master every job in the story, if you put the time and effort into it, and become the most powerful being in the game. Edited by The Illuminati, 14 October 2016 - 02:54 AM. - Picture/Discription - A dirty brown mop for hair, two dissimilar cannines, unnatural turquoise eyes and only the left eyebrow, Dar looks like that she came out too early, even for a Goblin but her physique is nothing that would hint at premature birth. She just looks a bit tougher than others or maybe that's just her look. Brix - Boss man! Much stab, great fun. everyone other Goblin - Friends?!? Edited by Diabolical Rhapsody, 15 October 2016 - 01:51 AM. Surprised no one asked, but you can earn blessings just like regular skills. Just perform actions that please the gods and they will bestow their blessings on you. Holy = Good (charity, kindness), Infernal = Evil (murder, hate), Nature = The Four Elements (fire, earth, wind, water). 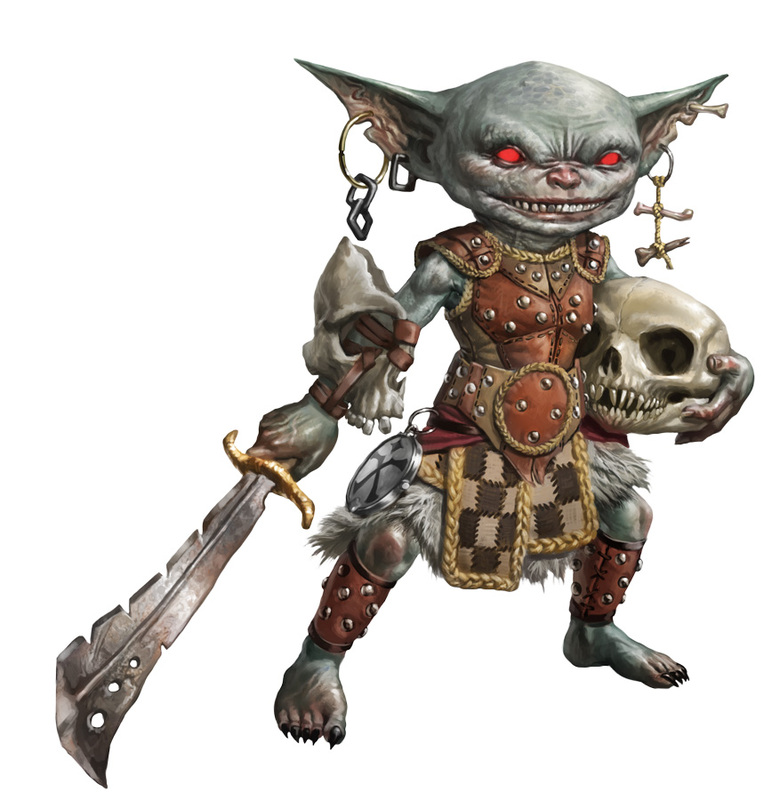 Appearance: Brix has bright, red eyes, greyish skin, and is even shorter than most Goblins but with the same bald head as most males of his species. He has a habit of decorating his ears with various trophies. Personality: Brix is cunning, and ferocious in combat -- always seeking the advantage and adapting his strategies on the fly. Outside of combat he prefers to spend his time indulging in various pleasures. - Dar: "Same generation gobbie, good friends, much kill and stabs, good-good fun!" Edited by The Illuminati, 14 October 2016 - 11:56 AM. Appearance: Frisk's skin colour is a deep slate-green, with a slight tinge of blue. Not quite Teal, but on it's way. It's also incredibly consistent in colour tone, small scars all over his body are the only breaks from keeping his skin one mass of the same smooth colour. His eyes are a bright orange with flecks of yellow, which contrasts against his skin quite radically, making his eyes stand out like a candle in a the darkness. His ears are a little larger than your average goblins, with pointed tips. Personality: The thing that defines Frisk is his senses. His senses are highly-tuned. This both annoys and pleases Frisk, because he loves food as a result of it. There's a whole world of eatable things out there and Frisk wants to find the best of the best, and then enjoy it more thoroughly than some could imagine. Sadly that means he has to suffer worse than most when it comes to eating bad food too. His delicate tongue savouring every last bit of that horrible slug-beetle and it's eggs. When he's not being led around by his senses, Frisk is being led by instinct and emotion. Rarely does he contemplate his actions, or the potential consequences, instead he simply does his actions, and then does more things afterwards for good measure. Making him fairly unpredictable. He loves to fight, eat and attempt new ways of making food tastier. Often he attempts this by fighting the food before he eats it. Combining his two favorite things, fighting and eating. He hasn't noticed much of a change in taste, except for that one time his food fell into a puddle of... something, as a result of the battle. That made it much worse. Much worse. Relationships: Frisk's only real relationship with anything is when they are being consumed by him. Thus far only a fist-sized rock has managed to elude this fate, and is well on it's way towards becoming Frisk's best friend. Edited by Unbelievably Majestic, 14 October 2016 - 11:47 AM. Appearance: What sets Lulu aside from the rest of the female goblins is her pale green skin and slit-like eyes. Her face is usually covered by her wavy ashen-gray hair. Personality: Lulu is inquisitive, simple-minded, and believes that might makes right. Edited by Juro, 14 October 2016 - 04:58 PM. I know X is in, but what about you KDP? If he's in, that'll bring our group to 6 players. You guys think anymore will join, or we should leave it there and start soon? Yeah I'm in I'm just at work so the ability to sit and think peacefully is minimum. But I'll be placing my character. Personality: Bayaal is a guy who doesn't have much confidence in himself. He fights to survive but he doesn't face danger without his trusty mask on. With his mask, he feels invincible and that confidence is felt on the battlefield. Despite being female, she stands as the tallest of her generation of goblins. Her eyes are darker then the night coupled with dark green skin and a mess of bloody-crimson like hair that tends to hide her eyes. Personality: Cold and calculating. She's a goblin that prefers to remain silent, however, when she does choose to speak, it's when she deems it necessary or to make light of someone for entertainment purposes and it's usually well thought out. She's also the type that won't help or do anything for others unless it benefits her in some way and has no qualms about betraying someone, especially her own kind, if it serves her own purposes. Has a mercenary way about things, her loyalty can be bought. Her silence also protects her true intentions. None, her only 'meaningful' relationships are when doing 'business'.